at 86 Southwest 8th Street, Miami. The development was completed in 2018. Leases for available units range in price from $2,075 to over $6,125. 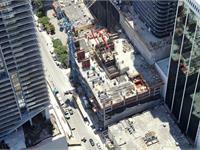 Solitair Brickell has a total of 438 units. Sizes range from 494 to 1533 square feet. In the middle of the bustling Brickell district of Miami, discover a brand new way to enjoy a life of luxury. Solitair Brickell offers you a variety of excellent floor plans and a selection of community amenities to make our Downtown Miami apartments the best place to be, including a 9th-floor bar lounge, a 48th-floor billiard lounge, TV lounge, and rooftop pool with spectacular views. At our luxury apartments for rent in Brickell Miami, you will enjoy spacious kitchens with elegant under-cabinet lighting, bathrooms with luxurious vertical spas, and much more. Contact us today for more information about our Brickell Miami apartments and find the perfect fit for your luxury lifestyle here at Solitair Brickell. Your inquiry will be delivered to the Solitair Brickell leasing team, who will send you more information about this development.